The word prodigal according to Merriam Webster dictionary means ~ carelessly and foolishly spending money, time etc. But in this case it is the reverse of the biblical verse Luke 15:11-32 The parable of the lost son. What do you do when you are oldest son but not the preferred child? Do you still try to win your father’s affection or do you just stand on the sideline and watch the show? Matthew Black and his wife Raquel are living LAC ~ life after Charlotte ~ with all the drama and trouble that she caused them with the kidnapping of their son MJ. Life has not been easy and trying to get back on track has been really stressing on Matthew but he loves Raquel and he is willing to try anything. When things start going sideways in his marriage once again they are really on a path that Matthew is not sure if he is willing to try to bring it back from. While he loves his wife, but is his love going to be enough this time? Dillon Whitfield is so glad to be around Curtis Black, that is all he ever wanted. He is so amazed at everything with Curtis but what he isn’t amazed with is the Black children. He understands that Curtis kids have the right to be around, he doesn’t want them around while he is around. They have had him all of their lives now it is his turn, he has missed out on 30 years and he won’t miss out on one more day! The Prodigal Son is not what you expect from the Curtis Black series because you don’t have much from Curtis himself but you DO have just as much of the Black family drama. You have the children going through their own situations with the parents in the background but they are always there providing that right amount of umph that you need to say “I know that Curtis/Charlotte has something to do with this!” You have the emotional ups and downs and it is the easy flow of the characters that you just know that it is a book written by Roby and you are glad about it and you can’t wait on with it. Congratulations on another great novel! The Prodigal Son is available everywhere novels are sold and in Kindle, Nook and Audible book forms. Daddy’s Girl by Ben Burgess Jr. Growing up we have dreams and fantasies. We may see a picture or watch a movie and think “Wow, I want a life just like that when I grow up.” We watch others and see how their lives are going and we know what we should and should not do, what we will and will not do. We set our plan and we go for it! Then POW! life happens and everything changes. There is nothing wrong with changing the direction that you were planning on going in but it is how you make the change and how you adapt that will determine how successful you will be in life. Nick Johnson has had an interesting life. It has not been the life that he has planned for but then again Nick hasn’t had a solid plan. Nick is a free spirit, he just kind of goes where the wind blows him if whatever he plans doesn’t go the way he planned it. He is a carpenter by trade but drinking and partying is the job of choice for Nick. When Nick is thrown a life altering change, will he deal with it the way that he has always dealt with life or will he step up and be the man that he needs to be? Daddy’s Girl is a great read! It is all about choices and good, bad or indifferent and how we choose to deal with them. Burgess has touched on some very good points in this novel about decisions and the choices we make. This is a very easy read because it flows very well but it is an emotional read at the same time making this a book that I would gladly recommend to all. I look forward to reading more from Burgess in the future, continued success! Daddy’s Girl is available for purchase through Amazon.com (Kindle and paperback) and BN.com on paperback. 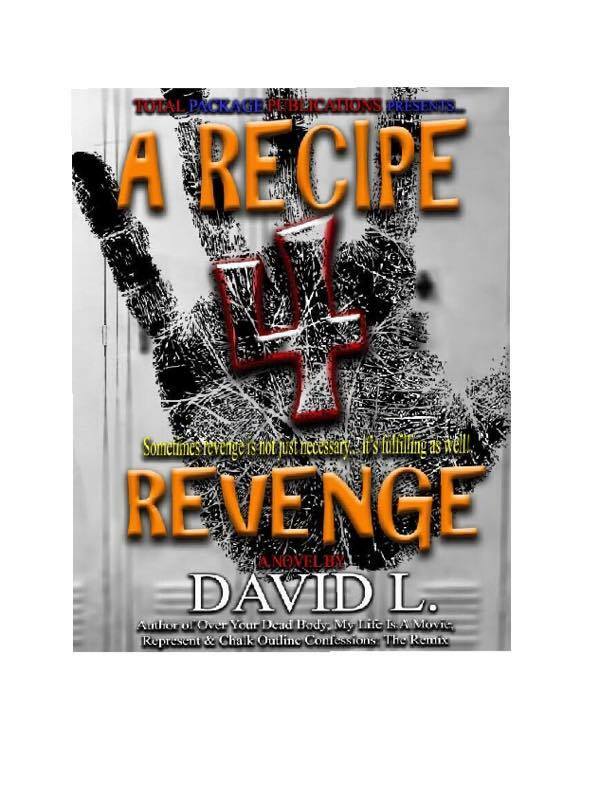 A Recipe 4 Revenge by David L.
As the old saying goes, “revenge is a dish best served cold” which means loosely that if and/or when you exact revenge it is best that there has been some time in between the occurrences. That way it is believed that the person has forgotten all about their mishaps and is living life smoothly. What happens when you don’t realize that you want revenge until you are forced into a situation when you can give it? Do you go through with it or are you content with living your life as it is? Sasha is a natural-born leader. Because she is so headstrong this has caused her some problems in her life. Just like the cat that she is, she lands on her feet. When Sasha goes to her 10-year high school reunion, the events of that night will set the course for what she believes her life will look like in the future. Is Sasha still young enough to accept this change or will she rebel against it will her everything. Letrice is the polar opposite of Sasha. She is quiet, blends in with the walls, and has an obsessive compulsive disorder. But if you push Letrice’s buttons just right she is just as fiery as Sasha if not more. What is it that can bring this person out of her shell or is there anything that can? Can Letrice be the person that she always knew she was or will she just be this woman who is a stranger to her in every sense of the word? A Recipe 4 Revenge is a story about a taboo that occurs in todays society that has been around longer than its existence. Oftentimes in society it is frowned upon for a child to tell on a person in authority or someone who is an adult. Children belong in their place, seen but not heard. The result of those types of situations more often spiral into an adulthood of trouble and trauma. David L. captures what happens when children are scared to talk or lacking trust in adults. It is a gripping tale of deceit and an attempt to regain trust in someone other than the ones that you believe who are there to protect you. You will be conflicted with the story but you will enjoy it. A Recipe 4 Revenge is available for purchase through Amazon.com on Kindle and through the publisher’s website: www.totapackagepublications.com.